During Bitcoin Wednesday on 1 November 2017, we’ll hear from Nina Boelsums and Luca van der Kamp, two of the students who successfully staged the Sleepwet.nl campaign for a national referendum against the Dutch Intelligence and Security Services Act 34 588. With the support of several NGOs, including Amnesty International, Nina, Luca and her team collected over 400,000 signatures passing the threshold for the national referendum which will be held during the municipal elections on 21 March, 2018. Exchange of this data with foreign agencies, including those of oppressive regimes. Nina Boelsums studies Industrial Design with a focus on the impact of new digital technologies on society. Luca van der Kamp has a degree in Computer Science and is currently studying logic, computability and complexity theory. 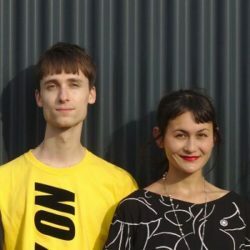 Nina Boelsums and Luca van der Kamp are two of the students who started the successful Sleepwet.nl campaign for a national referendum against the Dutch Intelligence and Security Services Act 34 588. Nina studies Industrial Design and focuses on the impact of new digital technologies on society. Luca van der Kamp has a degree in Computer Science and is currently studying logic, computability and complexity theory.